Doubling or trebling the pleasure got from the hobby by spending a little time on 'adding the details'to both locos, stock and structures. Reflections; to see is one thing (to look at). To observe another thing altogether (to take note). And what we all ought to do better in building our layouts. Builder's first attempt at "backwoods" US narrow gauge in On30 set in the mountains of Colorado. Designed as a response to a WRG challenge to build an operating layout in 3ft 3in x 12in plus fiddle yard. With plans for a larger layouts in the same vein, 8'6 or 12ft long x 1ft . Prototype German wagon works located in Nurenburg, showing the similarities with Graham Weller's "Eastham Works". Suggestions for a portable HO American switching yard 8ft x 12in, ideal for exhibiting, and serving one rail customer-a frozen food facility. Plan in HO for US industrial switching based on real life practice; set in an area with old and new buildings. Author describes industries and operating methods, 8ft x 2ft . 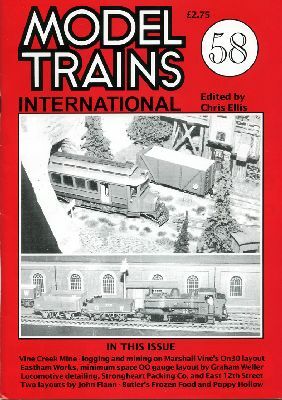 British OO branchline plan set in late 1950's to early 1960's. American author describes his 5ft x 2ft 8in plan. Scratchbuilt small Los Angeles lineside industry building as a subject to model. Award winning scenic OO classic layout 8ft x 7ft, of a GWR country branch line, featured the 'classic' oval for continuous running and scratch built structures.